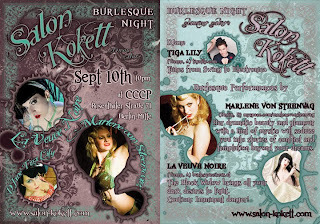 Tonight I am going to check out a new Burlesque party in Berlin! It looks like it will be fun with some really stunning performers! 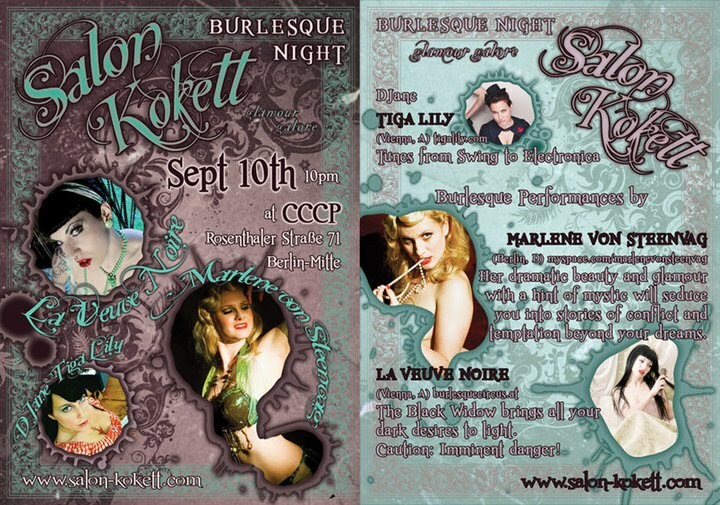 Its called Salon Kokett and its being held a CCCP Club! La Veuve Noire, Marlene Von Steenvag and DJane Tiga Lily playing music from Swing to Electronica. I’m really looking forward to it and hoping it will be as fabulous as Boheme Sauvage which is a 1920’s party that I went to recently and it was like stepping into a time machine! The people really dressed up for this occasion! The music, bands, performers and venue were fantastic! 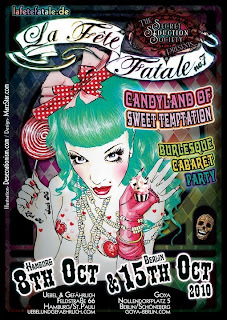 I am sponsoring another burlesque party that will be held in Hamburg and Berlin called La Fete Fatale. There are prizes for the best dressed and the theme is Candyland of sweet temptation. With another variety of performers! It will be on 8th October in Hamburg and 15th October in Berlin! I can’t wait!